Richard Nixon's victorious salute to White House staff members on the day he resigned as US President following the Watergate scandal. WATERGATE’S “WHAT IFS” are still tantalising. What if a security guard hadn’t noticed tape on a door latch outside Democratic headquarters at the Watergate office building not far from the White House? What if a calculating president hadn’t taped his private words for posterity? What if Richard Nixon simply had come clean about the break-in and cover-up, and apologised? Forty years of investigation, reporting, trials, debate and historical research have yielded no simple answer to how a clumsy raid that Nixon’s spokesman termed a “third-rate burglary” became a titanic constitutional struggle and led to his resignation. Of course, Watergate would never have happened had officials at Nixon’s re-election campaign committee not responded to his ceaseless demands for dirt on the opposition by hiring E. Howard Hunt and G. Gordon Liddy. The ex-CIA and ex-FBI operatives presented an outline, codenamed Operation Gemstone, that included bugging and rifling the files at Democratic National Committee headquarters. The five burglars were caught red-handed early on the morning of June 17, 1972 — actually, the second of two break-ins at the DNC — when security guard Frank Wills, seeing the taped latch, summoned police. “The insanity of it and the stupidity of it have never ceased to amaze me,” Dean, who’s now 73, said in an AP interview. Hunt died in 2007. Liddy, now a conservative radio host, declined an interview request. While there’s no evidence Nixon knew of the burglary plot beforehand, within days he was neck-deep in a conspiracy to hide the burglars’ ties to his campaign and the White House. Meeting with top aides, he readily agreed to paying hundreds of thousands of dollars in hush money and urged that the CIA intervene to block an FBI investigation. Following the money trail eventually led investigators to the truth, and began a more than two-year legal war involving grand juries, Congress and the Supreme Court. 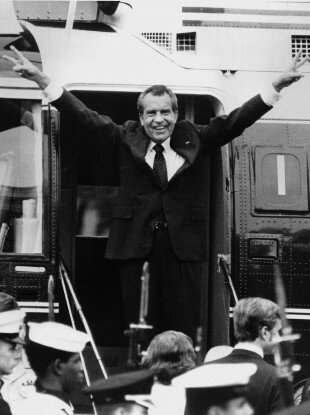 It ended when Nixon, facing certain impeachment, resigned from office on Aug. 8, 1974. Former Watergate prosecutor Richard Ben-Veniste says if Nixon hadn’t been forced by the Supreme Court to hand over his tapes, with their “smoking gun” of self-incrimination, things might have turned out differently. Why did he do it? In his memoirs, Nixon said he wished his administration to be “the best chronicled in history.” But without doubt he also wanted evidence in case someone attacked his decisions or motives. What the system did, however, is capture him ordering Chief of Staff HR Haldeman to get CIA Director Richard Helms to claim national security grounds in blocking the probe. “Play it tough,” Nixon instructed. The president spent months battling disclosure of conversations like that. But Kutler wonders what if instead, early on, he had adopted a different strategy and made a clean breast of things. Might America have forgiven him? “One of the mysteries of Watergate is why didn’t Richard Nixon come on television, look the camera in the eye — he was a master of that — and say, to us, the American people, ‘Yes, I had knowledge of this?’,” said Kutler, who, after Nixon’s death, won a lawsuit for the release of thousands of hours of tapes. Dean, not knowing he was being recorded, confronted Nixon over the cover-up, warning of a “cancer” devouring the presidency. He cited escalating money demands from the burglars, perhaps $1 million. “I thought that would stun him. It didn’t at all,” Dean recalled. “He said I know where we can get that.” Dean threw up his hands and went to prosecutors. In the end, 43 people, many of them senior officials, were either indicted, tried or went to prison because of Watergate. The roster included Nixon’s one time attorney general, his chief of staff and his domestic policy chief. Yet the political criminality under Nixon went far beyond the break-in and cover-up. It included enemies lists, tapping the phones of aides and reporters, campaign dirty tricks and even a break-in at the psychiatrist’s office of Daniel Ellsberg, leaker of the “Pentagon Papers” study of official lying over the Vietnam War. Egil “Bud” Krogh Jr., who led the White House “Plumbers” unit and did jail time for the 1971 Ellsberg caper, is convinced that the break-in, also carried out by Hunt and Liddy, was the real secret Nixon sought to cover up during Watergate. “It was a major breakdown in integrity,” he said. Indeed, looking through history’s lens it’s astonishing that so many top officials, many of them lawyers, did so many illegal things. Burglary. Theft. Conspiracy. Obstruction of justice. “We got across the line not really noticing it,” said Dean. Asked what he’d do differently, Dean said he never had a criminal lawyer on his White House staff, and should have. Every administration since Watergate has. Yet would any of these roads not taken have saved Nixon? Kutler has his doubts. In the end, the best explanation for why Watergate led to his downfall may be the president’s brooding personality. Email “After 40 years, the 'what ifs' of Watergate scandal are still tantalising ”. Feedback on “After 40 years, the 'what ifs' of Watergate scandal are still tantalising ”.